We live in an information and knowledge based economy and our ability to constantly learn is by far one of the most critical factors for success in this ‘Knowledge Economy’. In an earlier blog post, we already saw how higher education results in higher income. However education / degree is a point-in-time accomplishment mostly obtained somewhere in the 20-30 years of age. To thrive in this ‘Knowledge Economy’ we need to learn constantly and this post is about some research findings on ‘Learning’. Bill Gates, Warren Buffet, Charlie Munger, Elon Musk, Jeff Bezos, Mark Zuckerberg, Barack Obama, and many more very successful people are lifelong learners. Their reading habits put many of us to shame and I always assumed they are speed readers. Few years back I wanted to learn / practice speed reading and read couple of books on the topic and attended a training. 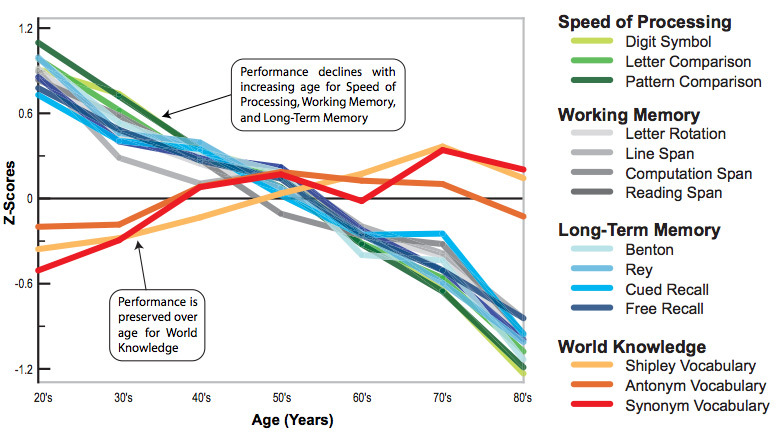 Soon I realized that speed reading works mostly to quickly consume information such as news, mails, reports, etc. and not very effective for gaining wisdom / knowledge where reflection, analysis and critical thinking plays a vital role. Last year I took a course on ‘Learning How to Learn’, by Dr. Barbara Oakley and since then have also stumbled upon few more research findings relating to learning. 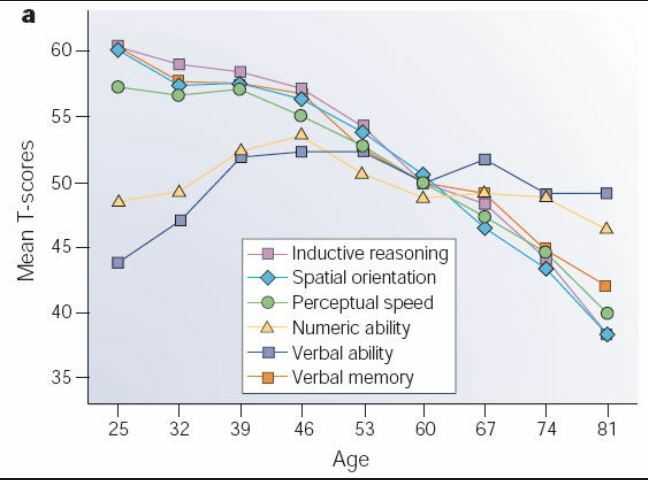 As you can see in the graph above, many of our cognitive abilities such as inductive reasoning, perceptual speed, verbal memory, etc. all start to decline after around 25 years of age. The only thing that increases and remains relatively stable over the years is verbal knowledge. This clearly explains the epidemic of management jargons, high-sounding political talk and bullshitting with no real content everywhere :). Here is another study that shows similar findings. It appears that a great deal of learning depends on the nucleus basalis, located in the basal forebrain. Among other things, this bit of the brain produces significant amounts of acetylcholine, a neurotransmitter that regulates the rate at which new connections are made between brain cells. Between birth and the age of ten or eleven, the nucleus basalis is permanently ‘switched on’. Typically this means that a child is learning almost all the time. Teen years through the peak learning years, this faculty is applied for selective learning. What can we do to be lifelong learners? or intense focus, maintained through repetition or continuous application. Learning new things such as foreign language, taking music classes, acquiring a new hobby are few common things one can do to keep the learning juices flowing. However to focus on the theme of thriving in the ‘Knowledge Economy’ – long brain-storming sessions / deep-dives, focused trainings, on the job training, incessant problem solving sessions etc. are very effective in triggering the flow of the neuro transmitter. 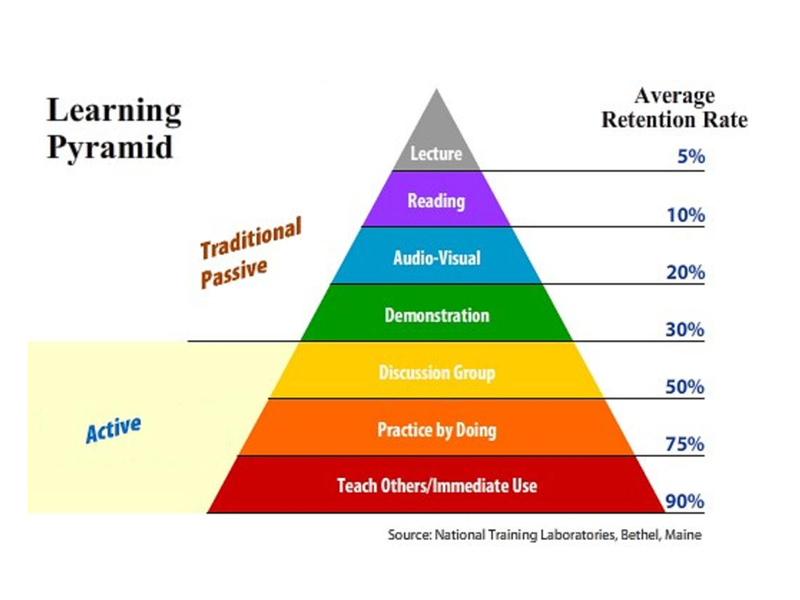 As you can see in the Learning Pyramid below, passive learning is not very effective. Active engagement on the topic of interest is very effective in retaining the learning. At least for me, this very practice of blogging has helped me solidify my learning very effectively. Discomfort is essential for learning – New neural networks are formed only after one sustains through a bit of discomfort / mental frustration. Anything that comes easily goes off easily. A little bit of discomfort is essential for learning. Learning is Antifragile. Similar to muscles, your brain also needs tough work-outs to grow and become strong. Sleep over to process learning – Things that one struggles to get right magically gets easy after a good and restful sleep. I have seen this phenomenon when thinking about a problem at work and not making any progress. After a restful sleep, somehow ideas start to flow and dots start to connect in more meaningful ways. Beware of ‘Illusion of Competence’ – Because you observed something (say a presentation) or have a book or access to the information, makes you believe you know the topic / subject. The way to eliminate such illusion is to actually test yourself by doing it or recalling the material. Mistakes are good in learning since they exposes your illusion of competence. Practicing easy things will create more illusion of competence. Age is not your best friend and success does not come about easily. As Charles Darwin observed – the survival of the fittest is the natural order of evolution. In today’s information and knowledge based world, the definition of fittest is a lot more cognitive in addition to the physical fitness. Constantly learning is one of the ways to survive in this Knowledge Economy. The “Key” to learning as we age is “Intellectual Stimulation”. We must continually strive to do this or you don’t continue to learn.